Is your breastfeeding baby constantly spitting up? Acid reflux in infants is common, even for a breastfeeding baby. It is important to understand what is just normal spitting up, what is reflux and when it is something more to worry about. As unpleasant as it is sometimes, infants spitting up is common. It often even makes for some laughs on occasion because they tend to do it when it is LEAST convenient for mom! Spitting up is especially common during the first three months of age, for most babies, it will disappear as he or she grows older. If you know that the spit up is normal and have determine by the tips below that it is nothing to worry about, the best thing to do is to keep a burp rag handy and be ready for it! This too shall pass! Just as importantly as being ready, don’t let others tell you that it is your milk. You have decided that you want to give your baby the very best of milk, but others may tell you that you should stop breastfeeding and give your baby special baby formula instead. If your doctor or nurse suggests this, seek out a more breastfeeding-friendly health professional to help. Warning: Formula will just make matters worse. (Worse yet, the formula that they feed a baby with reflux problems will run up to almost $40 a can!) Breast is really the best…even more so if your breastfeeding baby has acid reflux. Don’t let anyone tell you different. The formula companies have spent years trying to lie to you about this! Let’s look and see what is causing baby to spit up. Remember, it is perfectly normal. One reason could be that he is getting too much to eat at one time(commonly called oversupply.) This will automatically fill his tummy up causing him to reject it. You have to think of it as you would eating in any way. If you eat too much and get full, you may want to rid some of it to feel more comfortable. While breastfeeding moms generally can eat almost anything, sometimes babies with more sensitive tummies, may not like those gassy foods we eat ourselves. Well you know as well as we that whatever you take in, baby will take in as well. The most important way to know is to pay attention to your baby. There are certain foods that are known to cause more upset than others. 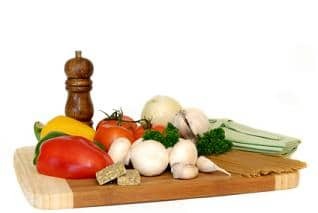 Click here to see a list of foods to watch. 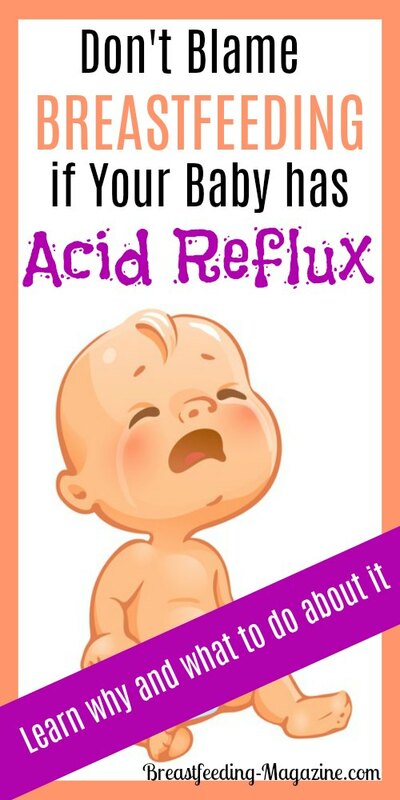 A lot of times some mothers will find that their let down reflux is too fast and may cause the baby to actually take more at a time than needed. This will cause him to spit up a lot as well. There are ways that you can position the baby to keep him from eating it too fast and prevent him from spiting back out. One way is the football position and then there is a sitting up position as well. Make sure that you are burping your baby as much as you can, to prevent air from getting trapped. This also causes him to spit up. It is also best to allow your baby to nurse one breast beyond “emptying” it and not be in a rush to switch sides. The reason for this is because there is more fat that the baby needs in the hind milk. The more he nurses and the less full your breast is, the more essential fat he gets and helps keep the spitting up down to a minimum as well. One of the things that helps a lot of little ones is to angle the crib or bassinet to an angle that makes your baby swallow and digest better. There are also great wedges like this memory foam pillow that help to angle your baby properly in his or her bassinet. Some of the moms that we talked to said that it not only improved the acid reflux and even symptoms of colic. 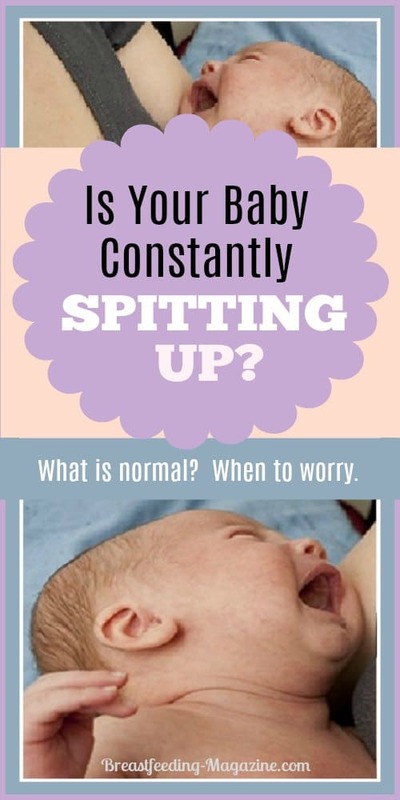 Spitting up seems to come with the territory when you care for a growing baby. It often comes at unexpected moments, and you may worry that your baby isn’t getting adequate nutrition if it occurs too often. For most babies, this is a natural part of developing a strong digestive system that won’t interfere with their ability to grow and thrive. Yet, every parent needs to be aware of a more serious condition known as gastroesophageal reflux disease. Not all babies suffer from this condition, but it’s important to recognize the signs if it does impact your baby. Gastroesophageal Reflux (GER) – This is basic acid reflux. Food goes back into the esophagus after it is deposited into the stomach. It is the reason many babies spit it, but it isn’t a serious concern. It’s often a result of the baby’s immature digestive system. Your baby should continue to gain weight, and the condition shouldn’t cause much pain or discomfort. Gastroesophageal Reflux Disease (GERD) – This is a more severe form of GER that involves more intense spitting up that often comes with more discomfort and pain. Spitting up is often more forceful and aggressive with this condition. Your baby is more likely to lose weight or gain weight slowly while experiencing other symptoms, which we will discuss in a moment. GERD is believed to have a genetic component, but most people won’t develop the disease until they’re older. There are still some babies who start to suffer from a young age, and some show their first signs within the first year of life. While this is the time during which many babies are breastfeeding, GERD isn’t caused by breast milk or the manner in which you’re feeding. The cause is the baby’s sphincter muscle. This is a small muscle that works like a door between the esophagus and stomach. As food travels through the esophagus, the door opens so that it passes easily into the stomach. The door should then shut so that the food doesn’t go back into the esophagus. When a baby suffers from GER, the door is undeveloped and allows small amounts of food to pass back into the esophagus. For most babies, the sphincter muscle eventually gains strength and starts to perform its job more effectively. For babies with GERD, the muscle is weak and continues to allow the contents of the stomach to regurgitate. The amount of food coming back up is often more severe in babies with GERD. Most babies have acid reflux or GER in the first few months of life. Their digestive systems are still developing, and that sphincter muscle needs time to strengthen. Some babies continue to suffer with reflux through the first year of life, but only 10% of babies over 12 months have the condition. These are likely babies who suffer from the more severe form, or GERD. If all babies spit up during the first year of life, how do you know if your baby suffers from GERD and may need medical attention? Many parents and caregivers first notice that their baby seems to spit up far more often and in more voluminous amounts than other babies. Parents with multiple children may realize this faster than first-time parents because they know that the baby is spitting up more than their other children at the same age. You may also start to think about GERD if your baby isn’t gaining weight fast enough or even seems to lose weight. This is a sign that the baby isn’t getting enough nutrients and calories due to spitting up too much of their milk. In some cases, a pediatrician or family doctor will notice the baby’s failure to thrive and will ask about issues with spitting up and other common signs of GERD. When a baby starts to display even one or two of these symptoms, it’s obviously distressing for the parents, caregivers, and everyone else involved. As soon as you start to suspect that something is happening beyond a baby’s normal tendency to spit up, you should visit your doctor with a list of your baby’s symptoms. The earlier GERD is diagnosed, the faster you can relieve symptoms and help your baby grow at an appropriate rate. Upper GI Endoscopy – An endoscope fitted with a camera is inserted through the baby’s mouth and down the esophagus and into the stomach. This allows the gastroenterologist to look for internal signs of GERD or other conditions that may cause your baby’s symptoms. Biopsies are often taken for further testing. Upper GI Series – X-rays are taken of the baby’s upper gastrointestinal tract to look for signs of GERD or other conditions. Most babies will drink barium mixed with another liquid prior to the x-rays, which increases the chances of detecting problems within the GI tract. Esophageal PH and Impedance Monitoring – This is a more extensive test, but it’s also the most effective. A thin tube is inserted through the nose into the stomach, and then pulled up into the esophagus. It is left there while your baby continues with normal daily activities. The amount of acid entering the esophagus from the stomach is measured over time. If most of these tests sound scary, rest assured that most infants never need to receive them. Only more severe cases of GERD that aren’t effectively controlled with medication will need extensive testing for further diagnosis. What can you do to help ease the symptoms of GER or GERD for your baby? Start by never forcing your baby to feed beyond their comfort. They’re more likely to experience acid reflux when they overfill their stomach. You an also hold your baby in a slightly upright position and place them in a swing or car seat that is slightly upright while their food is digesting. They’re more likely to spit up when eating or digesting while resting on a flat surface.